We had some friends over recently, so I had the perfect excuse to create a summery tablescape for 4. I love entertaining and I do think the best part of it is the build up to the day. 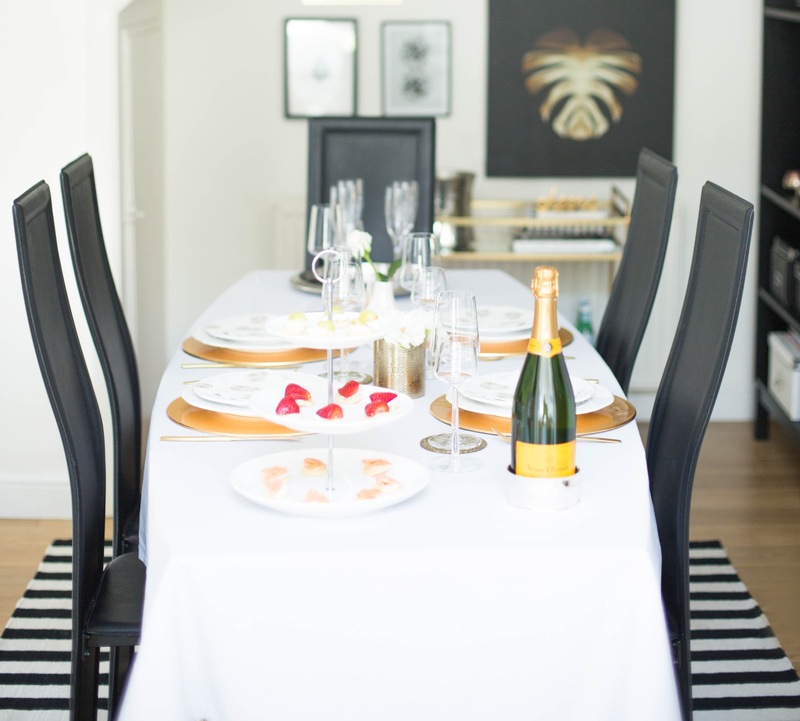 I always plan the food, wine and table setting well in advance so that everything runs smoothly on the day. We had a really lovely casual evening with some nibbles, food and drinks and we ended up spending a good part of the night in the garden sipping wine and chatting. I really wish this summer would never end. I tend to go for light and airy tablescapes during the summer months. I love light coloured table cloths and I don't even own a colourful one. 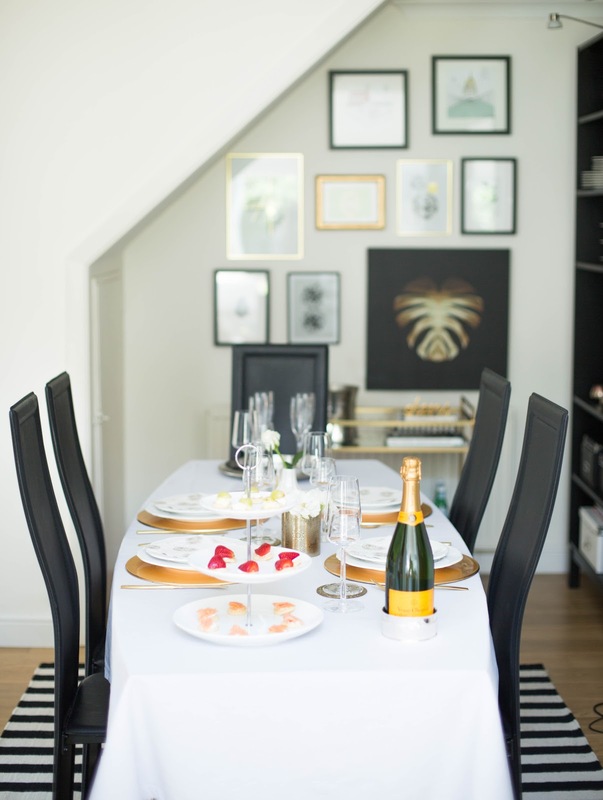 I much prefer accessorising the dinner table with some gold accessories and introducing colour in smaller doses. 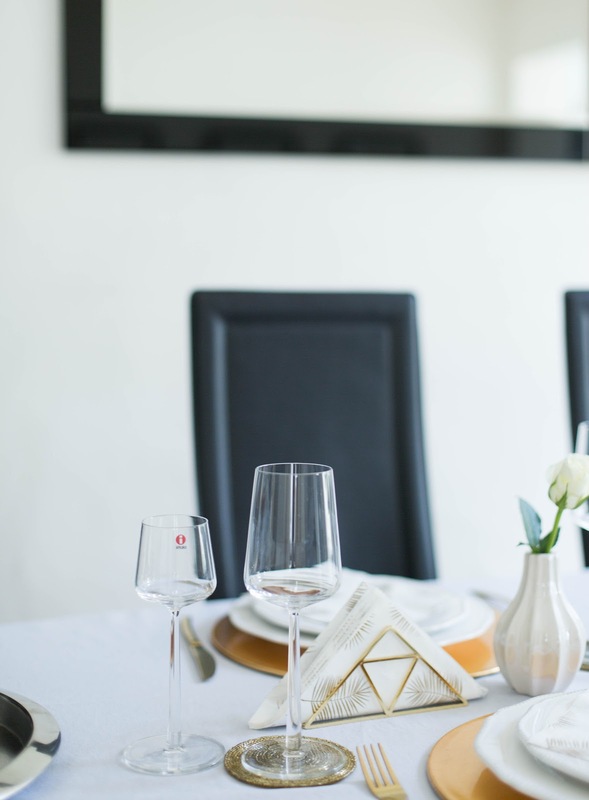 The light grey table cloth is from H&M Home and it's such a great value. It's 100% cotton so the ironing part is a bit of work but I love how big it is. It's always better to go for a bigger size by the way. Obviously, you should measure your table first but I find that after the first wash cotton tends to shrink so I always go for a generous size if possible. 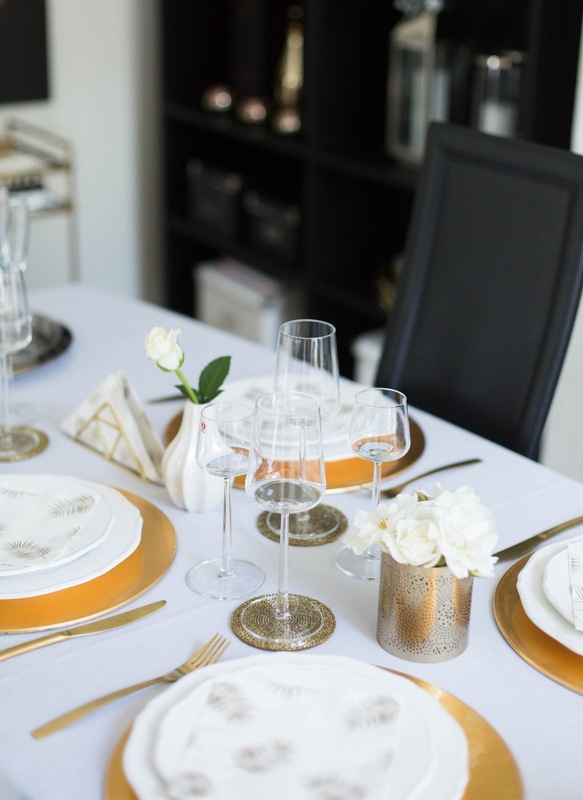 I wanted to add some gold accents to the dinner table to give it a bit more glamorous look. Brass and gold are absolutely timeless and I can't imagine getting bored of them anytime soon. I also like to mix metallics, especially gold, bras and silver. These days these are no rules, so feel free to experiment. 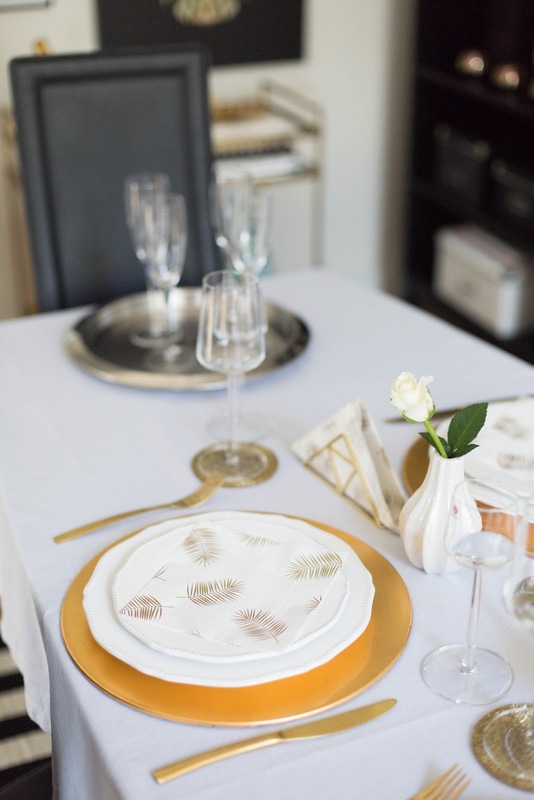 I picked up the gold leaf napkins also from H&M Home and I love how they introduce a bit of pattern to the table setting. White roses are always an elegant choice, so I decided to add some of our home grown roses to the tablescape. I used a large brass lantern from Next as a mini vase, which did the job perfectly. In case you're wondering, I did place a shot glass inside the lantern so the roses would be in clean, fresh water. I don't get many days out of home grown roses though, but I do love using some single roses for table settings occasionally. I'm definitely a bit of a foodie, although I'd say all my recipes are super easy. Blinis, also known as Russian pancakes, are my favourite starter. They are so easy to make and really brighten up the table setting. Blinis taste divine with a glass of bubbly, so I totally recommend them if you're planning to throw a dinner party. 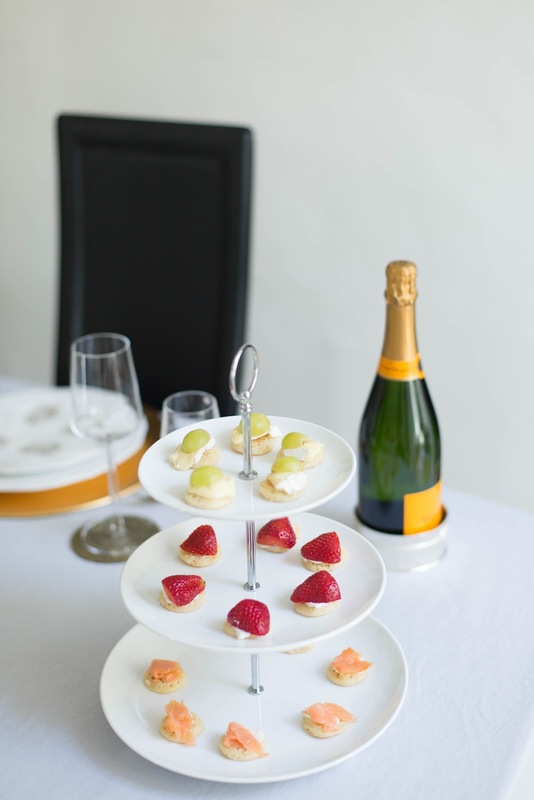 I also love using the 3-tier cake stand when entertaining. It saves so much space on the table and looks pretty impressive too. 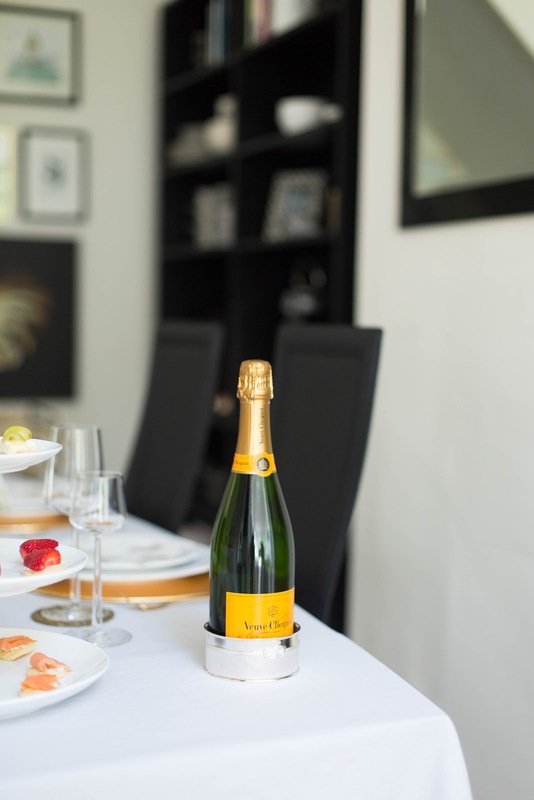 I wanted to pick a summery looking bottle of bubbly for this tablescape and let's face it, Veuve Cliquet never disappoints. The yellow label brings just the right amount of colour to the table setting. 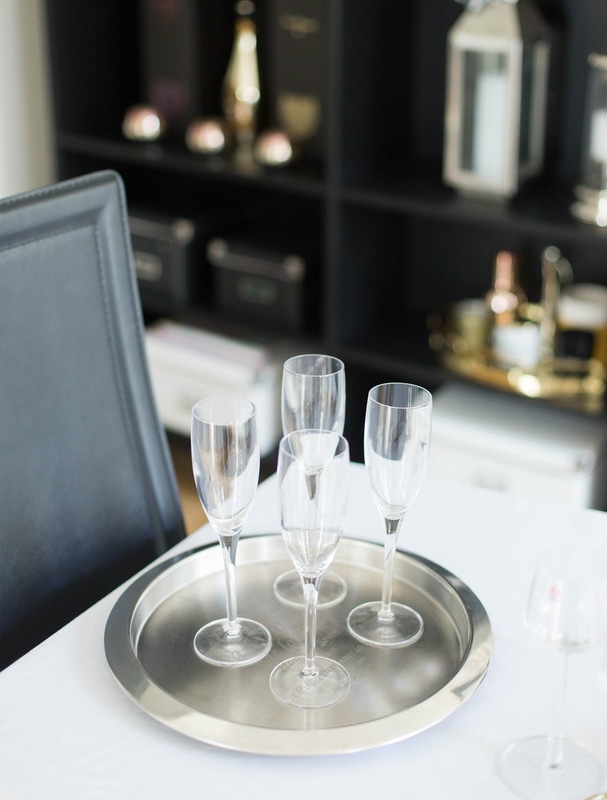 Our silver plated tray has been also getting a lot of use lately. I actually picked it up from our local charity shop few years ago. It was brand new, so I couldn't believe my luck. Now I probably own about 10 trays but you can never have too many trays, can you? If you're planning the perfect summer get together, don't forget to check out the The Glossy Guide to Summer Entertaining! I love this summer tablescape. It looks beautiful.